When a rider is taking a horse from the practice pen to competitions, sometimes horses get progressively better. They may do great at first then start to develop issues. No matter where you are at in your horses career, it is possible that you and your horse can find yourselves faced with obstacles, or simply fall apart. The first thing you should do is sit down and hit the rewind button on your memory. Think about when you had some of your best runs. What bit did you use? What were you doing in the practice pen? Have you changed feed? Ty Mitchell encourages riders to go back to their old videos to see if their riding has changed. It can be a small thing like timing or a rider over-riding their horse trying to go faster. Sometimes in the pursuit of a win, we get to changing everything and stray away from what has worked for us. When we are not getting the results we want, it is time to break things back down. Good fitting equipment and high quality tack go a long way. 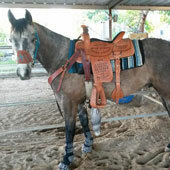 An ill fitting saddle can restrict your horse, make them stiff, and cause soreness. 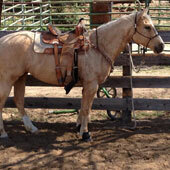 Making sure your saddle fits is something that is important as you horse grows and matures. This is sometimes forgotten. What fit them as a 3 year old, may be pinching them as an 8 year old, due to them filling out. You may be able to go with a thinner pad or may need to get a a wider saddle. Keeping your pads clean so they do not develop hard spots is also important. Adding a pad in, like the 5 Star flex fit, can also help relieve wither pressure and free the shoulder up. Cinches made of natural material, like mohair, are essential since neoprene girth’s can rub or pinch. Neoprene can also cause horses to shorten their stride. If after an evaluation and you know you have not changed much, but you're still finding you and your horse have a problem a vet visit for a lameness exam is a great idea. Just to be sure it’s not caused from pain. If the vet has cleared your horse, it’s time to start looking at some other factors. The last thing you will want to go back to is your horse's foundation. Remember to do your flexing, bending, and other basics to check for any cracks. Be cautious on over working your horse on the pattern. A lot of times, problems can be fixed in dry work. Ty Mitchell believes that a rider should be familiar with a horse's tendencies, “Knowing where your horse seems to cut corners is important; simply at a walk and a trot. In practice, at times, we will squeeze by a barrel but in a run that will be magnified.” Anyone can practice, but if you're practicing not knowing where your problems are coming from, it will keep you from accomplishing your goals. Having another pair of eyes and a professional opinion can help you over come frustrating struggles and stop them before they become bad habits. 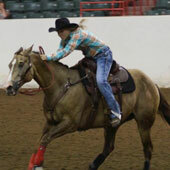 Remember, when you are faced with a challenge to Rewind back to when you and your horse were working at your best. Less is more.